Manufacturing growth in the bloc was minimal last month, at a four-year low, and forward looking indicators suggest there will be no turnaround soon. Germany's manufacturing sector contracted for the first time in more than four years as Europe's powerhouse was hit by trade tensions although activity in France rebounded, helped by jobs growth. British factories are scrambling to stockpile goods at the fastest rate since records began in the early 1990s as they brace for a potentially chaotic Brexit in less than two months' time. Yet growth was weaker than expected and optimism waned. Last week, the International Monetary Fund cut its world growth forecasts for this year and next and said failure to resolve protectionism could further destabilise the slowing global economy. "Unfortunately, the situation still looks set to get worse first. We have to brace ourselves for an ongoing string of weak economic data driven by, but not confined to, much weaker global trade," said Holger Schmieding, chief economist at Berenberg. On Wednesday, the U.S. Federal Reserve signalled its three-year-drive to tighten monetary policy may be at an end amid a suddenly cloudy outlook for the U.S. economy. Trump, speaking at the White House during a meeting with Chinese Vice Premier Liu He, said he was optimistic the world's two largest economies could reach "the biggest deal ever made." "A lot depends on whether the U.S. and China come to a reasonable deal. Then we can actually avert this potential trade recession, but at the moment it's all tentative," said Irene Cheung, Asia strategist at ANZ. 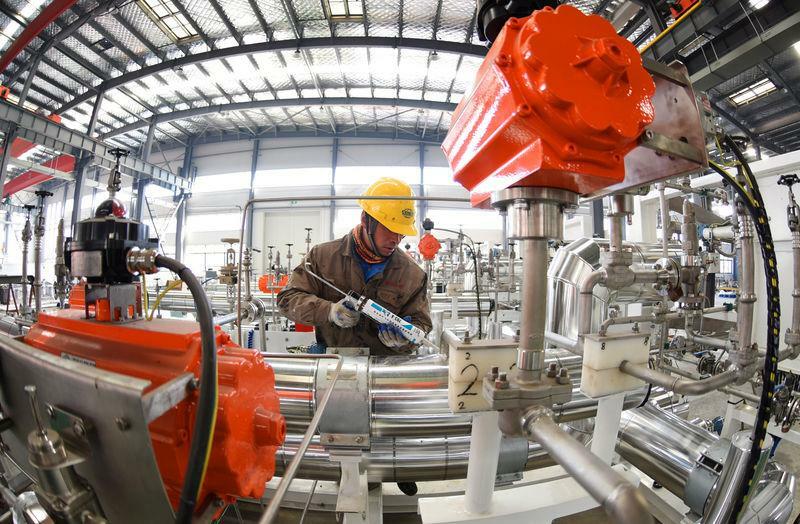 China's factory activity shrank the most in almost three years in January as new orders slumped further and output fell, the private Caixin/Markit PMI survey showed. The numbers were weaker than Thursday's official PMI survey, but both suggested the economy is continuing to slow. Many firms scale back operations or close for long periods around the holidays, which begin on Feb. 4 this year. Still, workers, business owners and labour activists have told Reuters companies are shutting earlier than usual as the trade war bites, with some likely to close for good. Spreading beyond manufacturing, the global impact of China's slowdown means cost-conscious Chinese tourists will chose destinations closer to home for the week off, rather than more expensive trips further afield. "The global outlook is a bit more at risk from China today than it was, say, two or three years ago," said Sonal Desai, chief investment officer at Franklin Templeton Fixed Income. Japan's factory activity was the slowest in 29 months, with weakening exports and output suggesting it could soon fall into contraction. Manufacturers in the world's No.3 economy are facing both falling exports and a likely slump in domestic demand when the country's sales tax is hiked in October. Freight rates for dry-bulk and container ships, carriers of most of the world's raw materials and finished goods, have plunged over the last six months.